After searching for this, you'll find advice to reset TPS, kick stand switch, battery terminals loose, tilt sensor, relay, battery itself, ECM fail, and more. My issue was 2006 bike was running, then stopped mid traffic. Would crank, could hear fuel pump run and pressurize as expected. 20k miles so far, so not young but not too old either. I did TPS reset, plugs, new battery, checked for codes (got exhaust servo and low battery), swapped relays, check fuses, then gave up. Just cranked and hardly popped or sputtered. turns out the hose from the fuel pump to regulator got brittle and cracked, thus just letting the fuel pump circulate gas and not feed the in-tank regulator. You'll need to pull fuel pump, replace hoses, and get 2 big o-rings. Big thanks to Rio Grande Shovelheads in El Paso for the find and fix. Thanks for posting that... this is the second post I saw indicating that line failed. Good to see if it becomes a trend, given it is a reasonably easy fix. This will be the 3rd post. 2006 Buell Ulysses would run decent but after long ride and sitting would be hard to start. Eventually I was riding on the freeway and started losing power, limped home and thought is was the fuel pump itself. Turned out to be the line between pump and fuel pressure regulator. Replaced it with same size gas line and Uly still running great 6 years later. Good to know, thanks for the data point Gmaple. I just had that pump apart on both my Uly's, and didn't bother replacing the filter on either of them. But not feeling any power loss either. How many miles did you have? Any specific gas concerns in your area? Buell had 10,000 miles when I bought it. It had been sitting for awhile with low fuel in tank. I think the line dried out. I bought the bike with a known fueling issue which is why I got a great deal. That line cost about $4 bucks. I lucked out. The only other problem I've had is the dreaded ecu contacting the seat. I replaced it with a used ebay component and relocated it. This is the old pump to pressure regulator hose from my '06. This has been sitting in the shed for a year or so after I removed the pump assembly last Christmas. Two things to note. When I pulled it out I noticed fuel weeping from near the bend in this hose when everything else had evaporated and found this small hole worn through. 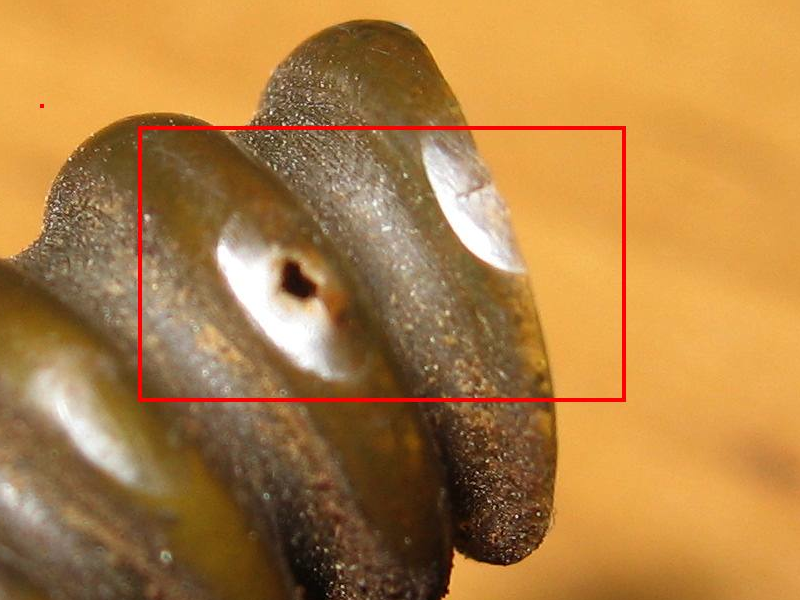 The there are two shiny spots visible here that show where the pipe has been rubbing on the inside of the frame. The other point is you will notice the pipe is broken - after I had it out of the tank for a while and it had dried completely it was as brittle as you like. This pump assembly had been in use for just over 60,000 miles and had seen Ethanol E10 a lot - whether that was a contributing factor I don't know.